Recently the Indian government issued new norms allowing single-brand retail trading and exemption from local sourcing for 'state-of-the-art' and 'cutting edge' technology with a waiver for three years, and the option to extend it for five years. Apple chief executive officer Tim Cook has said the tech giant is 'looking forward' to setting up retail stores in India to tap into the booming smartphone market in India. "India is now one of our fastest growing markets. 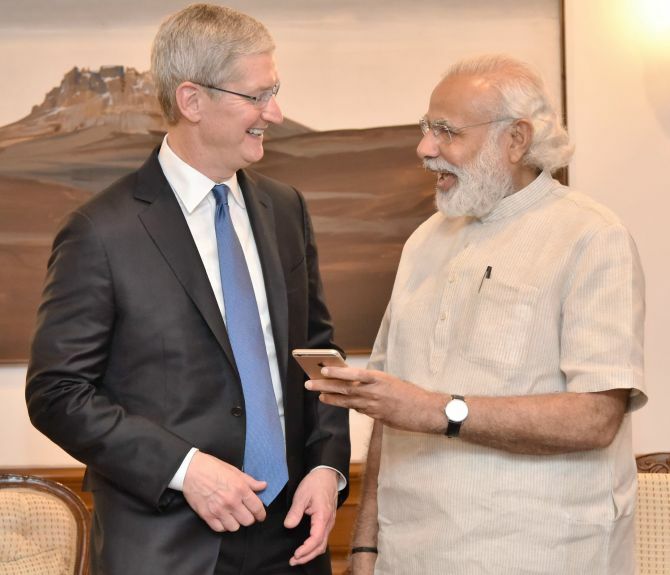 "In the first three quarters of this fiscal year, our iPhone sales in India were up 51 per cent year-on-year," Apple CEO Tim Cook said on an investor call. He added the company has announced setting up of a design and development accelerator to support Indian developers creating innovative applications for iOS and opened a new office in Hyderabad to accelerate maps development. "We're looking forward to opening retail stores in India down the road, and we see huge potential for that vibrant country," he said without disclosing details. Cook, who visited India in May, had discussed issues, including manufacturing and setting up retail stores in the country, with Prime Minister Narendra Modi. "On a personal note, during the past quarter I visited China and India, and I am very encouraged about our growth prospects in those countries," he said. Sources had said Apple may have to submit a fresh application for the same. The Cupertino-based tech giant on Tuesday reported its revenues rising to $42.4 billion in the third quarter, driven by markets, including India, Russia, Brazil, Turkey and Canada.